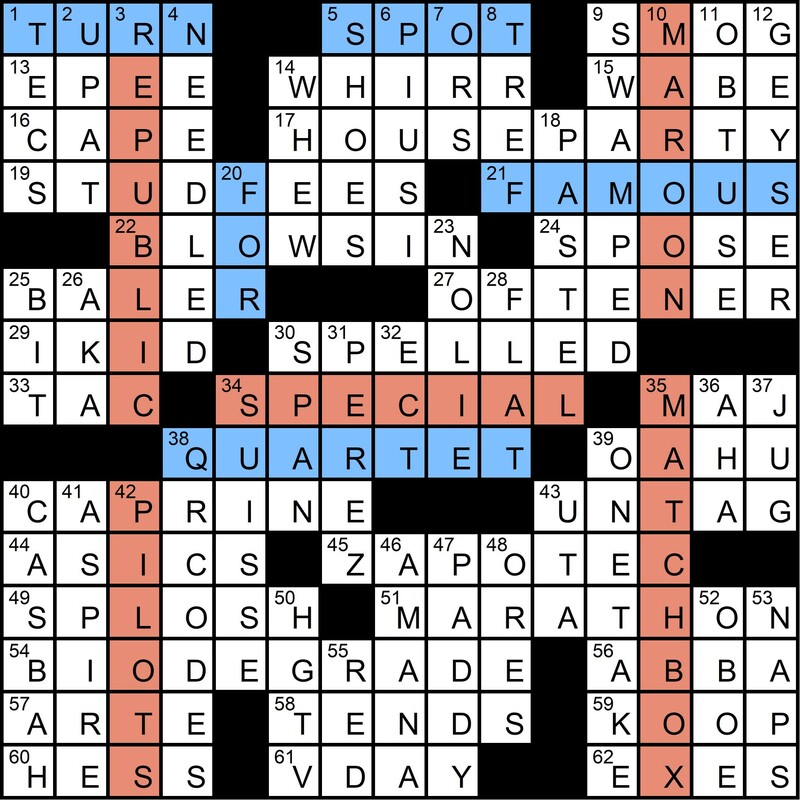 The correctly selected entries spell out TURN SPOT FOR FAMOUS QUARTET. Turning SPOT, in a cryptic sense, gives TOPS, and points to the famous quartet that is this month’s meta answer: The Four Tops. Some solvers noticed the cryptic nudge in the clue for TURN, which references the April MMMM (that puzzle involved turning around different beats in the theme answers). Only 128 people found their way to the solution this month, the lowest total of the year. This month I chose to cover a Four Tops cover. They had a hit with “Walk Away Renee” in 1968. My version is based on a Rickie Lee Jones live recording that I highly recommend checking out. Hope you like it! m5rammy So hard, and yet so straight-forward. very nice. Diana The clue for 1A was perfect for solving the meta. 1A is TURN; see above for explanation. jsolomon1999 I guess the grid is too small for BLINK or HAIRCUT. I did consider using LEVEL 42, but figured they weren’t as well known. BarbaraK I was actually thinking about the Four Tops early on, because HOUSEtop, BOXtop, FLATtop, and UPtop. That did not seem up to your usual standard of elegance though. So I kept looking. And I’m glad I did. Turning SPOT was lovely! Gwinns Only thing I’d wish for is some sort of Jackson 5 trap (could 1D be TITO?) since the 4 Tops is the only other R&B group with a number that leaps to mind. That would be devious! A few people got lucky and guessed the correct answer this month. Evan suggests cluing PEREZ as [Bandleader Prado nicknamed King of the Mambo] and MARATHON as [Rush song that begins “It’s not how fast you can go / The force goes into the flow”]. Redhead64 suggests cluing SWAMPED as [Lacuna Coil song featured in the soundtrack to “Resident Evil: Apocalypse”]. fheaney suggests cluing PADDY as [McAloon of Prefab Sprout]. JanglerNPL Normally I don’t include a punny comment, but this time I can’t help myself. That’s alright, sugar pie honey bunch. Paul Coulter THE best! FOUR Stars (out of 4) It was the TOPS! The average rating for the puzzle was 4.37 stars out of 5, second-highest of the year, and the average difficulty rating was 3.83, the highest of the year. This month’s randomly chosen winner of an MMMM coffee mug is David Erb from London, England. Thanks to Matt Gaffney for blogging the puzzle at Crossword Fiend, where you can rate the puzzle (thanks!) and/or leave a comment.